Star Anise - 1 No. 1. 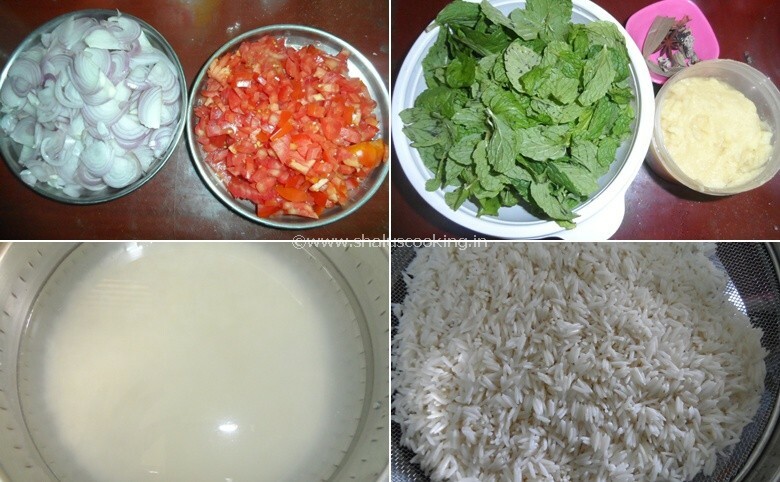 Keep all the ingredient ready to make Biriyani Style Mint Rice. a. Slice the onions lengthwise. b, Finely chop the tomatoes. c. De-stem the mint leaves and wash it thoroughly to remove impurities. d. Prepare ginger garlic paste. e. Soak the Basmati Rice for 20 to 30 minutes in water. Drain the water and keep the rice separately. 2. Heat oil in a pressure cooker and add all the items listed under "To Temper" section and fry for few seconds. Add the sliced onions. 3. Saute the onions till light brown color. Add ginger garlic paste. 4. Saute till the raw smell of ginger garlic paste vanishes. Add the chopped tomatoes. 5. Saute till the tomatoes turn soft. Add the garam masala and slat. Cook till the tomatoes become mushy. 6. Add mint leaves, green chilies and tamarind to a blender and grind it to a paste by adding little water. 7. Add the mint paste to pressure cooker and mix well. Allow it to boil for 2 minutes. Now add curd to it and mix well. 8. Now add the soaked and drained rice and mix it gently. 9. Pour 3 to 3.25 cups of water to rice and mix well. Bring it to boil. Now squeeze the juice of one lemon and mix well. Note: Rice and Water Ratio should be 1 Cup Rice : 1.5 Cup of water. 10. Close the pressure cooker and cook it for 3 whistles. Wait till the pressure is completely release. Open the pressure cooker and add a tablespoon of ghee and mix it gently. Biriyani Style Mint Rice - Mint Biriyani is ready to serve.